The French for conceive is the irregular IR verb concevoir. To remember this, imagine you can imagine and CONCEIVE WIRE that is revolutionary! - se concevoir (vr) : to be conceivable, to be understandable, to be designed. - (il est) concevable (que) + subjunctive (adj) : (it is) conceivable (that). - mal/bien conçu : badly/well conceived. Verbs ending in -oir and conjugated in this way include: concevoir, décevoir, percevoir, recevoir . A memory trigger helps you conceive and recall French words more easily, try Cartoon Memory Triggers. To remember a word, think of the pic! 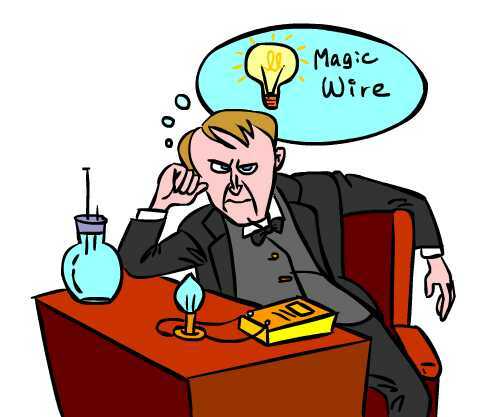 You can imagine and CONCEIVE WIRE that is revolutionary! conceive! conçois ! concevons ! concevez ! ✔ concevoir is an irregular IR verb. ✔ Learn concevoir and it will reinforce the pattern for ALL those other irregular IR verbs. ✔ You can more easily remember words and verbs like the French verb concevoir -French for conceive - using the techniques of the world's Memory Masters. 200 Words a Day! Free Daily French Lesson Online - the verb in French for conceive is concevoir- fully conjugated. French Learning Made Fun and Fast with your free Daily French Verb Lesson - concevoir.